This article is about the chemical element. For other uses, see Platinum (disambiguation). Platinum is a chemical element with symbol Pt and atomic number 78. It is a dense, malleable, ductile, highly unreactive, precious, silverish-white transition metal. Its name is derived from the Spanish term platino, meaning "little silver". Platinum is a member of the platinum group of elements and group 10 of the periodic table of elements. It has six naturally occurring isotopes. It is one of the rarer elements in Earth's crust, with an average abundance of approximately 5 μg/kg. It occurs in some nickel and copper ores along with some native deposits, mostly in South Africa, which accounts for 80% of the world production. Because of its scarcity in Earth's crust, only a few hundred tonnes are produced annually, and given its important uses, it is highly valuable and is a major precious metal commodity. Platinum is one of the least reactive metals. It has remarkable resistance to corrosion, even at high temperatures, and is therefore considered a noble metal. Consequently, platinum is often found chemically uncombined as native platinum. Because it occurs naturally in the alluvial sands of various rivers, it was first used by pre-Columbian South American natives to produce artifacts. It was referenced in European writings as early as 16th century, but it was not until Antonio de Ulloa published a report on a new metal of Colombian origin in 1748 that it began to be investigated by scientists. Platinum is used in catalytic converters, laboratory equipment, electrical contacts and electrodes, platinum resistance thermometers, dentistry equipment, and jewelry. Being a heavy metal, it leads to health problems upon exposure to its salts; but due to its corrosion resistance, metallic platinum has not been linked to adverse health effects. Compounds containing platinum, such as cisplatin, oxaliplatin and carboplatin, are applied in chemotherapy against certain types of cancer. As of 2018, the value of platinum is $833.00 per ounce. Pure platinum is a lustrous, ductile, and malleable, silver-white metal. Platinum is more ductile than gold, silver or copper, thus being the most ductile of pure metals, but it is less malleable than gold. The metal has excellent resistance to corrosion, is stable at high temperatures and has stable electrical properties. Platinum does oxidize, forming PtO2, at 500 °C; this oxide can be easily removed thermally. It reacts vigorously with fluorine at 500 °C (932 °F) to form platinum tetrafluoride. It is also attacked by chlorine, bromine, iodine, and sulfur. Platinum is insoluble in hydrochloric and nitric acid, but dissolves in hot aqua regia (A mixture of nitric and hydrochloric acids), to form chloroplatinic acid, H2PtCl6. Its physical characteristics and chemical stability make it useful for industrial applications. Its resistance to wear and tarnish is well suited to use in fine jewellery. As a soft acid, platinum has a great affinity for sulfur, such as on dimethyl sulfoxide (DMSO); numerous DMSO complexes have been reported and care should be taken in the choice of reaction solvent. In 2007, Gerhard Ertl won the Nobel Prize in Chemistry for determining the detailed molecular mechanisms of the catalytic oxidation of carbon monoxide over platinum (catalytic converter). Platinum has six naturally occurring isotopes: 190Pt, 192Pt, 194Pt, 195Pt, 196Pt, and 198Pt. The most abundant of these is 195Pt, comprising 33.83% of all platinum. It is the only stable isotope with a non-zero spin; with a spin of 1/2, 195Pt satellite peaks are often observed in 1H and 31P NMR spectroscopy (i.e., Pt-phosphine and Pt-alkyl complexes). 190Pt is the least abundant at only 0.01%. Of the naturally occurring isotopes, only 190Pt is unstable, though it decays with a half-life of 6.5×1011 years, causing an activity of 15 Bq/kg of natural platinum. 198Pt can undergo alpha decay, but its decay has never been observed (the half-life is known to be longer than 3.2×1014 years); therefore, it is considered stable. Platinum also has 31 synthetic isotopes ranging in atomic mass from 166 to 204, making the total number of known isotopes 39. The least stable of these is 166Pt, with a half-life of 300 µs, whereas the most stable is 193Pt with a half-life of 50 years. Most platinum isotopes decay by some combination of beta decay and alpha decay. 188Pt, 191Pt, and 193Pt decay primarily by electron capture. 190Pt and 198Pt are predicted to have energetically favorable double beta decay paths. Platinum is an extremely rare metal, occurring at a concentration of only 0.005 ppm in Earth's crust. It is sometimes mistaken for silver. Platinum is often found chemically uncombined as native platinum and as alloy with the other platinum-group metals and iron mostly. Most often the native platinum is found in secondary deposits in alluvial deposits. The alluvial deposits used by pre-Columbian people in the Chocó Department, Colombia are still a source for platinum-group metals. Another large alluvial deposit is in the Ural Mountains, Russia, and it is still mined. In nickel and copper deposits, platinum-group metals occur as sulfides (e.g. (Pt,Pd)S), tellurides (e.g. PtBiTe), antimonides (PdSb), and arsenides (e.g. PtAs2), and as end alloys with nickel or copper. 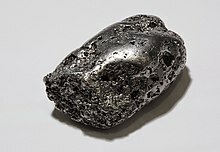 Platinum arsenide, sperrylite (PtAs2), is a major source of platinum associated with nickel ores in the Sudbury Basin deposit in Ontario, Canada. At Platinum, Alaska, about 17,000 kg (550,000 ozt) was mined between 1927 and 1975. The mine ceased operations in 1990. The rare sulfide mineral cooperite, (Pt,Pd,Ni)S, contains platinum along with palladium and nickel. Cooperite occurs in the Merensky Reef within the Bushveld complex, Gauteng, South Africa. In 1865, chromites were identified in the Bushveld region of South Africa, followed by the discovery of platinum in 1906. In 1924, the geologist Hans Merensky discovered a large supply of platinum in the Bushveld Igneous Complex in South Africa. The specific layer he found, named the Merensky Reef, contains around 75% of the world's known platinum. The large copper–nickel deposits near Norilsk in Russia, and the Sudbury Basin, Canada, are the two other large deposits. In the Sudbury Basin, the huge quantities of nickel ore processed make up for the fact platinum is present as only 0.5 ppm in the ore. Smaller reserves can be found in the United States, for example in the Absaroka Range in Montana. 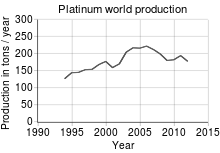 In 2010, South Africa was the top producer of platinum, with an almost 77% share, followed by Russia at 13%; world production in 2010 was 192,000 kg (423,000 lb). Large platinum deposits are present in the state of Tamil Nadu, India. Hexachloroplatinic acid mentioned above is probably the most important platinum compound, as it serves as the precursor for many other platinum compounds. By itself, it has various applications in photography, zinc etchings, indelible ink, plating, mirrors, porcelain coloring, and as a catalyst. Treatment of hexachloroplatinic acid with an ammonium salt, such as ammonium chloride, gives ammonium hexachloroplatinate, which is relatively insoluble in ammonium solutions. Heating this ammonium salt in the presence of hydrogen reduces it to elemental platinum. Potassium hexachloroplatinate is similarly insoluble, and hexachloroplatinic acid has been used in the determination of potassium ions by gravimetry. All three reactions are reversible. Platinum(II) and platinum(IV) bromides are known as well. Platinum hexafluoride is a strong oxidizer capable of oxidizing oxygen. Unlike palladium acetate, platinum(II) acetate is not commercially available. Where a base is desired, the halides have been used in conjunction with sodium acetate. The use of platinum(II) acetylacetonate has also been reported. anions. Platinum also exhibits negative oxidation states at surfaces reduced electrochemically. The negative oxidation states exhibited by platinum are unusual for metallic elements, and they are attributed to the relativistic stabilization of the 6s orbitals. Zeise's salt, containing an ethylene ligand, was one of the first organometallic compounds discovered. Dichloro(cycloocta-1,5-diene)platinum(II) is a commercially available olefin complex, which contains easily displaceable cod ligands ("cod" being an abbreviation of 1,5-cyclooctadiene). The cod complex and the halides are convenient starting points to platinum chemistry. Archaeologists have discovered traces of platinum in the gold used in ancient Egyptian burials as early as 1200 BC. However, the extent of early Egyptians' knowledge of the metal is unclear. It is quite possible they did not recognize there was platinum in their gold. The metal was used by pre-Columbian Americans near modern-day Esmeraldas, Ecuador to produce artifacts of a white gold-platinum alloy. Archeologists usually associate the tradition of platinum-working in South America with the La Tolita Culture (circa 600 BC - AD 200), but precise dates and location is difficult, as most platinum artifacts from the area were bought secondhand through the antiquities trade rather than obtained by direct archeological excavation. To work the metal, they employed a relatively sophisticated system of powder metallurgy. The platinum used in such objects was not the pure element, but rather a naturally occurring mixture of the platinum group metals, with small amounts of palladium, rhodium, and iridium. The first European reference to platinum appears in 1557 in the writings of the Italian humanist Julius Caesar Scaliger as a description of an unknown noble metal found between Darién and Mexico, "which no fire nor any Spanish artifice has yet been able to liquefy". From their first encounters with platinum, the Spanish generally saw the metal as a kind of impurity in gold, and it was treated as such. It was often simply thrown away, and there was an official decree forbidding the adulteration of gold with platinum impurities. This alchemical symbol for platinum was made by joining the symbols of silver (moon) and gold (sun). Antonio de Ulloa is credited in European history with the discovery of platinum. In 1735, Antonio de Ulloa and Jorge Juan y Santacilia saw Native Americans mining platinum while the Spaniards were travelling through Colombia and Peru for eight years. Ulloa and Juan found mines with the whitish metal nuggets and took them home to Spain. 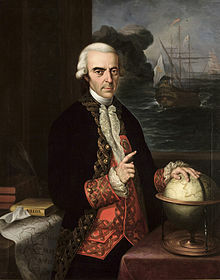 Antonio de Ulloa returned to Spain and established the first mineralogy lab in Spain and was the first to systematically study platinum, which was in 1748. His historical account of the expedition included a description of platinum as being neither separable nor calcinable. Ulloa also anticipated the discovery of platinum mines. After publishing the report in 1748, Ulloa did not continue to investigate the new metal. In 1758, he was sent to superintend mercury mining operations in Huancavelica. In 1741, Charles Wood, a British metallurgist, found various samples of Colombian platinum in Jamaica, which he sent to William Brownrigg for further investigation. In 1750, after studying the platinum sent to him by Wood, Brownrigg presented a detailed account of the metal to the Royal Society, stating that he had seen no mention of it in any previous accounts of known minerals. Brownrigg also made note of platinum's extremely high melting point and refractoriness toward borax. 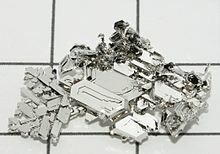 [clarification needed] Other chemists across Europe soon began studying platinum, including Andreas Sigismund Marggraf, Torbern Bergman, Jöns Jakob Berzelius, William Lewis, and Pierre Macquer. In 1752, Henrik Scheffer published a detailed scientific description of the metal, which he referred to as "white gold", including an account of how he succeeded in fusing platinum ore with the aid of arsenic. Scheffer described platinum as being less pliable than gold, but with similar resistance to corrosion. Carl von Sickingen researched platinum extensively in 1772. He succeeded in making malleable platinum by alloying it with gold, dissolving the alloy in hot aqua regia, precipitating the platinum with ammonium chloride, igniting the ammonium chloroplatinate, and hammering the resulting finely divided platinum to make it cohere. Franz Karl Achard made the first platinum crucible in 1784. He worked with the platinum by fusing it with arsenic, then later volatilizing the arsenic. Because the other platinum-family members were not discovered yet (platinum was the first in the list), Scheffer and Sickingen made the false assumption that due to its hardness—which is slightly more than for pure iron—platinum would be a relatively non-pliable material, even brittle at times, when in fact its ductility and malleability are close to that of gold. Their assumptions could not be avoided because the platinum they experimented with was highly contaminated with minute amounts of platinum-family elements such as osmium and iridium, amongst others, which embrittled the platinum alloy. Alloying this impure platinum residue called "plyoxen" with gold was the only solution at the time to obtain a pliable compound, but nowadays, very pure platinum is available and extremely long wires can be drawn from pure platinum, very easily, due to its crystalline structure, which is similar to that of many soft metals. In 1786, Charles III of Spain provided a library and laboratory to Pierre-François Chabaneau to aid in his research of platinum. Chabaneau succeeded in removing various impurities from the ore, including gold, mercury, lead, copper, and iron. This led him to believe he was working with a single metal, but in truth the ore still contained the yet-undiscovered platinum-group metals. This led to inconsistent results in his experiments. At times, the platinum seemed malleable, but when it was alloyed with iridium, it would be much more brittle. Sometimes the metal was entirely incombustible, but when alloyed with osmium, it would volatilize. After several months, Chabaneau succeeded in producing 23 kilograms of pure, malleable platinum by hammering and compressing the sponge form while white-hot. Chabeneau realized the infusibility of platinum would lend value to objects made of it, and so started a business with Joaquín Cabezas producing platinum ingots and utensils. This started what is known as the "platinum age" in Spain. An aerial photograph of a platinum mine in South Africa. South Africa produces 80% of the world production and has most of the world's known platinum deposits. Platinum, along with the rest of the platinum-group metals, is obtained commercially as a by-product from nickel and copper mining and processing. During electrorefining of copper, noble metals such as silver, gold and the platinum-group metals as well as selenium and tellurium settle to the bottom of the cell as "anode mud", which forms the starting point for the extraction of the platinum-group metals. If pure platinum is found in placer deposits or other ores, it is isolated from them by various methods of subtracting impurities. Because platinum is significantly denser than many of its impurities, the lighter impurities can be removed by simply floating them away in a liquid. Platinum is paramagnetic, whereas nickel and iron are both ferromagnetic. These two impurities are thus removed by running an electromagnet over the mixture. Because platinum has a higher melting point than most other substances, many impurities can be burned or melted away without melting the platinum. Finally, platinum is resistant to hydrochloric and sulfuric acids, whereas other substances are readily attacked by them. Metal impurities can be removed by stirring the mixture in either of the two acids and recovering the remaining platinum. One suitable method for purification for the raw platinum, which contains platinum, gold, and the other platinum-group metals, is to process it with aqua regia, in which palladium, gold and platinum are dissolved, whereas osmium, iridium, ruthenium and rhodium stay unreacted. The gold is precipitated by the addition of iron(II) chloride and after filtering off the gold, the platinum is precipitated as ammonium chloroplatinate by the addition of ammonium chloride. Ammonium chloroplatinate can be converted to platinum by heating. Unprecipitated hexachloroplatinate(IV) may be reduced with elemental zinc, and a similar method is suitable for small scale recovery of platinum from laboratory residues. Mining and refining platinum has environmental impacts. Of the 218 tonnes of platinum sold in 2014, 98 tonnes were used for vehicle emissions control devices (45%), 74.7 tonnes for jewelry (34%), 20.0 tonnes for chemical production and petroleum refining (9.2%), and 5.85 tonnes for electrical applications such as hard disk drives (2.7%). The remaining 28.9 tonnes went to various other minor applications, such as medicine and biomedicine, glassmaking equipment, investment, electrodes, anticancer drugs, oxygen sensors, spark plugs and turbine engines. The most common use of platinum is as a catalyst in chemical reactions, often as platinum black. It has been employed as a catalyst since the early 19th century, when platinum powder was used to catalyze the ignition of hydrogen. Its most important application is in automobiles as a catalytic converter, which allows the complete combustion of low concentrations of unburned hydrocarbons from the exhaust into carbon dioxide and water vapor. Platinum is also used in the petroleum industry as a catalyst in a number of separate processes, but especially in catalytic reforming of straight-run naphthas into higher-octane gasoline that becomes rich in aromatic compounds. PtO2, also known as Adams' catalyst, is used as a hydrogenation catalyst, specifically for vegetable oils. Platinum also strongly catalyzes the decomposition of hydrogen peroxide into water and oxygen and it is used in fuel cells as a catalyst for the reduction of oxygen. From 1889 to 1960, the meter was defined as the length of a platinum-iridium (90:10) alloy bar, known as the International Prototype Meter bar. The previous bar was made of platinum in 1799. Until May 2019, the kilogram is defined by the International Prototype Kilogram; a cylinder of the same platinum-iridium alloy made in 1879. The standard hydrogen electrode also uses a platinized platinum electrode due to its corrosion resistance, and other attributes. Platinum is a precious metal commodity; its bullion has the ISO currency code of XPT. Coins, bars, and ingots are traded or collected. Platinum finds use in jewellery, usually as a 90–95% alloy, due to its inertness. It is used for this purpose for its prestige and inherent bullion value. Jewellery trade publications advise jewellers to present minute surface scratches (which they term patina) as a desirable feature in attempt to enhance value of platinum products. In watchmaking, Vacheron Constantin, Patek Philippe, Rolex, Breitling, and other companies use platinum for producing their limited edition watch series. Watchmakers appreciate the unique properties of platinum, as it neither tarnishes nor wears out (the latter quality relative to gold). The price of platinum, like other industrial commodities, is more volatile than that of gold. In 2008, the price of platinum dropped from $2,252 to $774 per oz, a loss of nearly 2/3 of its value. By contrast, the price of gold dropped from ~$1,000 to ~$700/oz during the same time frame, a loss of only 1/3 of its value. During periods of sustained economic stability and growth, the price of platinum tends to be as much as twice the price of gold, whereas during periods of economic uncertainty, the price of platinum tends to decrease due to reduced industrial demand, falling below the price of gold. Gold prices are more stable in slow economic times, as gold is considered a safe haven. Although gold is used in industrial applications, its demand is not so driven by industrial uses. In the 18th century, platinum's rarity made King Louis XV of France declare it the only metal fit for a king. In the laboratory, platinum wire is used for electrodes; platinum pans and supports are used in thermogravimetric analysis because of the stringent requirements of chemical inertness upon heating to high temperatures (~1000 °C). Platinum is used as an alloying agent for various metal products, including fine wires, noncorrosive laboratory containers, medical instruments, dental prostheses, electrical contacts, and thermocouples. Platinum-cobalt, an alloy of roughly three parts platinum and one part cobalt, is used to make relatively strong permanent magnets. Platinum-based anodes are used in ships, pipelines, and steel piers. Platinum's rarity as a metal has caused advertisers to associate it with exclusivity and wealth. "Platinum" debit and credit cards have greater privileges than "gold" cards. "Platinum awards" are the second highest possible, ranking above "gold", "silver" and "bronze", but below diamond. For example, in the United States, a musical album that has sold more than 1 million copies will be credited as "platinum", whereas an album that has sold more than 10 million copies will be certified as "diamond". Some products, such as blenders and vehicles, with a silvery-white color are identified as "platinum". Platinum is considered a precious metal, although its use is not as common as the use of gold or silver. The frame of the Crown of Queen Elizabeth The Queen Mother, manufactured for her coronation as Consort of King George VI, is made of platinum. It was the first British crown to be made of this particular metal. According to the Centers for Disease Control and Prevention, short-term exposure to platinum salts may cause irritation of the eyes, nose, and throat, and long-term exposure may cause both respiratory and skin allergies. The current OSHA standard is 2 micrograms per cubic meter of air averaged over an 8-hour work shift. The National Institute for Occupational Safety and Health has set a recommended exposure limit (REL) for platinum as 1 mg/m3 over an 8-hour workday. Platinum-based antineoplastic agents are used in chemotherapy, and show good activity against some tumors. As platinum is a catalyst in the manufacture of the silicone rubber and gel components of several types of medical implants (breast implants, joint replacement prosthetics, artificial lumbar discs, vascular access ports, etc. ), the possibility that platinum could enter the body and cause adverse effects has merited study. The Food and Drug Administration and other institutions have reviewed the issue and found no evidence to suggest toxicity in vivo. ^ Hobson, Peter. "Currency shocks knock platinum to 10-year lows". Reuters. Retrieved 2018-08-20. ^ Wheate, N. J.; Walker, S.; Craig, G. E.; Oun, R. (2010). "The status of platinum anticancer drugs in the clinic and in clinical trials" (PDF). Dalton Transactions. 39 (35): 8113–27. doi:10.1039/C0DT00292E. hdl:2123/14271. PMID 20593091. ^ a b Lagowski, J. J., ed. (2004). Chemistry Foundations and Applications. 3. Thomson Gale. pp. 267–268. ISBN 978-0-02-865724-0. ^ J. C. Chaston, Platinum Metals Rev. 8, 50 (1964). ^ Sir Norman Lockyer (1891). Nature. Macmillan Journals Limited. pp. 625–. Archived from the original on 24 March 2017. ^ a b c CRC contributors (2007–2008). "Platinum". In Lide, David R. CRC Handbook of Chemistry and Physics. 4. New York: CRC Press. p. 26. ISBN 978-0-8493-0488-0. ^ Craig, Bruce D; Anderson, David S; International, A.S.M. (January 1995). "Platinum". Handbook of corrosion data. pp. 8–9. ISBN 978-0-87170-518-1. Archived from the original on 24 March 2017. ^ a b Kauffman, George B.; Thurner, Joseph J.; Zatko, David A. (1967). Ammonium Hexachloroplatinate(IV). Inorganic Syntheses. 9. pp. 182–185. doi:10.1002/9780470132401.ch51. ISBN 978-0-470-13240-1. ^ a b c Han, Y.; Huynh, H. V.; Tan, G. K. (2007). "Mono- vs Bis(carbene) Complexes: A Detailed Study on Platinum(II)−Benzimidazolin-2-ylidenes". Organometallics. 26 (18): 4612–4617. doi:10.1021/om700543p. ^ Ertl, Gerhard (2008). "Reactions at Surfaces: From Atoms to Complexity (Nobel Lecture)". Angewandte Chemie International Edition. 47 (19): 385–407. Bibcode:2012AnChe..51.3695M. doi:10.1002/anie.200800480. PMID 18357601. ^ Earth's natural wealth: an audit Archived 7 November 2014 at the Wayback Machine. New Scientist. 23 May 2007. ^ Stellman, Jeanne Mager (1998). Encyclopaedia of Occupational Health and Safety: Chemical, industries and occupations. International Labour Organization. p. 141. ISBN 978-92-2-109816-4. Archived from the original on 24 March 2017. ^ Murata, K. J. (1958). in Symposium on Spectrocemical Analysis for Trace Elements. ASTM International. p. 71. Archived from the original on 24 March 2017. ^ "The History of Platinum". Alaska Community Database Online. ExploreNorth. Archived from the original on 22 December 2010. Retrieved 12 April 2011. Platinum is located on the Bering Sea coast, below Red Mountain on the south spit of Goodnews Bay. ^ R. Grant Cawthorn (1999). "Seventy-fifth Anniversary of the Discovery of the Platiniferous Merensky Reef". Platinum Metals Review. Retrieved 24 Dec 2017. ^ a b Seymour, R. J.; O'Farrelly, J. I. (2001). "Platinum-group metals". Kirk Othmer Encyclopedia of Chemical Technology. Wiley. doi:10.1002/0471238961.1612012019052513.a01.pub2. ISBN 978-0471238966. ^ "Mining Platinum in Montana". New York Times. 13 August 1998. Archived from the original on 3 February 2008. Retrieved 9 September 2008. ^ Loferski, P. J. (July 2012). "Platinum–Group Metals" (PDF). USGS Mineral Resources Program. Archived (PDF) from the original on 7 July 2012. Retrieved 17 July 2012. ^ "Evidence of huge deposits of platinum in State". The Hindu. Chennai, India. 2 July 2010. Archived from the original on 6 December 2011. ^ Koeberl, Christian (1998). "Identification of meteoritic components in imactites". Meteorites: flux with time and impact effects. pp. 133–155. ISBN 978-1-86239-017-1. Archived from the original on 24 March 2017. ^ a b c Krebs, Robert E. (1998). "Platinum". The History and Use of our Earth's Chemical Elements. Greenwood Press. pp. 124–127. ISBN 978-0-313-30123-0. ^ Smith, G. F.; Gring, J. L. (1933). "The Separation and Determination of the Alkali Metals Using Perchloric Acid. V. Perchloric Acid and Chloroplatinic Acid in the Determination of Small Amounts of Potassium in the Presence of Large Amounts of Sodium". Journal of the American Chemical Society. 55 (10): 3957–3961. doi:10.1021/ja01337a007. ^ Schweizer, A. E.; Kerr, G. T. (1978). "Thermal Decomposition of Hexachloroplatinic Acid". Inorganic Chemistry. 17 (8): 2326–2327. doi:10.1021/ic50186a067. ^ Perry, D. L. (1995). Handbook of Inorganic Compounds. Nature. 177. pp. 296–298. Bibcode:1956Natur.177..639.. doi:10.1038/177639a0. ISBN 978-0-8493-8671-8. ^ Ahrens, Sebastian; Strassner, Thomas (2006). "Detour-free synthesis of platinum-bis-NHC chloride complexes, their structure and catalytic activity in the CH activation of methane". Inorganica Chimica Acta. 359 (15): 4789–4796. doi:10.1016/j.ica.2006.05.042. ^ Karpov, Andrey; Konuma, Mitsuharu; Jansen, Martin (2006). "An experimental proof for negative oxidation states of platinum: ESCA-measurements on barium platinides". Chemical Communications. 44 (8): 838–840. Bibcode:2008ChCom..44.5292T. doi:10.1039/b514631c. PMID 16479284. ^ Karpov, Andrey; Nuss, Jürgen; Wedig, Ulrich; Jansen, Martin (2003). "Cs2Pt: A Platinide(-II) Exhibiting Complete Charge Separation". Angewandte Chemie International Edition. 42 (39): 4818–4821. Bibcode:2012AnChe..51.3695M. doi:10.1002/anie.200352314. PMID 14562358. ^ a b Jansen, Martin (2005). "Effects of relativistic motion of electrons on the chemistry of gold and platinum". Solid State Sciences. 7 (12): 1464–1474. Bibcode:2005SSSci...7.1464J. doi:10.1016/j.solidstatesciences.2005.06.015. ^ Ghilane, J.; Lagrost, C.; Guilloux-Viry, M.; Simonet, J.; et al. (2007). "Spectroscopic Evidence of Platinum Negative Oxidation States at Electrochemically Reduced Surfaces". Journal of Physical Chemistry C. 111 (15): 5701–5707. doi:10.1021/jp068879d. ^ Riddell, Imogen A.; Lippard, Stephen J. (2018). "Cisplatin and Oxaliplatin:Our Current Understanding of Their Actions". In Sigel, Astrid; Sigel, Helmut; Freisinger, Eva; Sigel, Roland K. O. Metallo-Drugs:Development and Action of Anticancer Agents. Metal Ions in Life Sciences. 18. pp. 1–42. doi:10.1515/9783110470734-007. ISBN 978-3-11-046984-4. PMID 29394020. ^ Richards, A. D.; Rodger, A. (2007). "Synthetic metallomolecules as agents for the control of DNA structure". Chemical Society Reviews. 36 (3): 471–483. Bibcode:2012ChSRv..41.6507P. doi:10.1039/b609495c. PMID 17325786. Archived from the original on 3 March 2007. ^ Carinder, James A.; Morrison, Pilar M.; Morrison, David G.; Jack E. Saux III (7 July 2014). Practical Oncology Protocols. Mill City Press, Incorporated. p. 22. ISBN 978-1-62652-816-1. Archived from the original on 9 November 2017. Retrieved 11 June 2016. ^ Taguchi, Takashi; Nazneen, Arifa; Abid, M. Ruhul; Razzaque, Mohammed S. (2005). Cisplatin-Associated Nephrotoxicity and Pathological Events. Contributions to Nephrology. 148. pp. 107–121. doi:10.1159/000086055. ISBN 978-3-8055-7858-5. PMID 15912030. ^ Rayner W. Hesse (2007). Jewelrymaking Through History: An Encyclopedia. Greenwood Publishing Group. pp. 155–156. ISBN 978-0-313-33507-5. ^ David A. Scott and Warwick Bray (1980). "Ancient Platinum Technology in South America: Its use by the Indians in Pre-Hispanic Times". Platinum Metals Review. Retrieved 5 Nov 2018. ^ a b Donald McDonald, Leslie B. Hunt (1982). A History of Platinum and its Allied Metals. Johnson Matthey Plc. pp. 7–8. ISBN 978-0-905118-83-3. ^ a b c d e Weeks, M. E. (1968). Discovery of the Elements (7th ed.). Journal of Chemical Education. pp. 385–407. ISBN 978-0-8486-8579-9. OCLC 23991202. ^ Dixon, Joshua; Brownrigg, William (1801). The literary life of William Brownrigg. To which are added an account of the coal mines near Whitehaven: And Observations on the means of preventing epidemic fevers. p. 52. Archived from the original on 24 March 2017. ^ Watson, Wm; Brownrigg, William (1749). "Several Papers concerning a New Semi-Metal, Called Platina; Communicated to the Royal Society by Mr. Wm. Watson F. R. S" (PDF). Philosophical Transactions. 46 (491–496): 584–596. doi:10.1098/rstl.1749.0110. Archived from the original (PDF) on 21 October 2013. ^ Marggraf, Andreas Sigismund (1760). Versuche mit dem neuen mineralischen Körper Platina del pinto genannt. Archived from the original on 24 March 2017. ^ Loferski, P. J. (October 2011). "2010 Minerals Yearbook; Platinum-group metals" (PDF). USGS Mineral Resources Program. Archived (PDF) from the original on 8 July 2012. Retrieved 17 July 2012. ^ Heiserman, David L. (1992). Exploring Chemical Elements and their Compounds. TAB Books. pp. 272–274. ISBN 978-0-8306-3018-9. ^ Hunt, L. B.; Lever, F. M. (1969). "Platinum Metals: A Survey of Productive Resources to industrial Uses" (PDF). Platinum Metals Review. 13 (4): 126–138. Archived (PDF) from the original on 29 October 2008. ^ Kauffman, George B.; Teter, Larry A. & Rhoda, Richard N. (1963). Recovery of Platinum from Laboratory Residues. Inorg. Synth. Inorganic Syntheses. 7. pp. 232–236. doi:10.1002/9780470132388.ch61. ISBN 978-0-470-13238-8. ^ Loferski, P. J. (July 2016). "2014 Minerals Yearbook; Platinum-group metals" (PDF). USGS Mineral Resources Program. Archived (PDF) from the original on 18 August 2016. Retrieved 11 July 2016. ^ Petrucci, Ralph H. (2007). General Chemistry: Principles & Modern Applications (9th ed.). Prentice Hall. p. 606. ISBN 978-0-13-149330-8. ^ Laramie, James; Dicks, Andrew (2003). Fuel Cell System Explained. John Wiley & Sons Ltd. ISBN 978-0-470-84857-9. ^ Wang, C.; Daimon, H.; Onodera, T.; Koda, T.; Sun, S. (2008). "A general approach to the size- and shape-controlled synthesis of platinum nanoparticles and their catalytic reduction of oxygen". Angewandte Chemie International Edition. 47 (19): 3588–3591. Bibcode:2012AnChe..51.3695M. doi:10.1002/anie.200800073. PMID 18399516. ^ Gupta, S. V. (2010). "Chapter 4. Metre Convention and Evolution of Base Units". Springer Series in Materials Science, Volume 122. Springer Series in Materials Science. 122. p. 47. doi:10.1007/978-3-642-00738-5_4. ISBN 978-3-642-00777-4. ^ Feltham, A. M.; Spiro, Michael (1971). "Platinized platinum electrodes". Chemical Reviews. 71 (2): 177–193. doi:10.1021/cr60270a002. ^ "21.09kg Pt". WolframAlpha. Archived from the original on 23 August 2014. Retrieved 14 July 2012. ^ "Professional Jeweler's Magazine Archives, issue of August 2004". Archived from the original on 28 September 2011. Retrieved 19 June 2011. ^ "Platinum primer". Diamond Cutters International. 12 December 2008. Archived from the original on 27 September 2011. Retrieved 18 June 2011. ^ "Unknown Facts about Platinum". watches.infoniac.com. Archived from the original on 21 September 2008. Retrieved 9 September 2008. ^ "Fixing Statistics". The London Platinum and Palladium Market. Archived from the original on 25 January 2010. Retrieved 13 June 2010. ^ "One Year Platinum". Kitco. Archived from the original on 28 September 2011. Retrieved 28 June 2011. ^ "Platinum versus Gold". The Speculative Invertor. 14 April 2002. Archived from the original on 26 October 2008. ^ "Platinum". Minerals Zone. Archived from the original on 12 October 2008. Retrieved 9 September 2008. ^ Gwin, John (1986). "Pricing Financial Institution Products". Journal of Professional Services Marketing. 1 (3): 91–99. doi:10.1300/J090v01n03_07. ^ Crouse, Richard (1 May 2000). Big Bang Baby: The Rock Trivia Book. p. 126. ISBN 978-0-88882-219-2. Archived from the original on 24 March 2017. ^ Gauding, Madonna (6 October 2009). The Signs and Symbols Bible: The Definitive Guide to Mysterious Markings. ISBN 978-1-4027-7004-3. Archived from the original on 24 March 2017. ^ "Occupational Health Guideline for Soluble Platinum Salts (as Platinum)" (PDF). Centers for Disease Control and Prevention. Archived (PDF) from the original on 11 March 2010. Retrieved 9 September 2008. ^ "CDC – NIOSH Pocket Guide to Chemical Hazards – Platinum". www.cdc.gov. Archived from the original on 21 November 2015. Retrieved 21 November 2015. ^ "FDA Backgrounder on Platinum in Silicone Breast Implants". U.S. Food and Drug Administration. Archived from the original on 24 July 2008. Retrieved 9 September 2008. ^ Brook, Michael (2006). "Platinum in silicone breast implants". Biomaterials. 27 (17): 3274–3286. doi:10.1016/j.biomaterials.2006.01.027. PMID 16483647. Young, Gordon (November 1983). "The Miracle Metal—Platinum". National Geographic. Vol. 164 no. 5. pp. 686–706. ISSN 0027-9358. OCLC 643483454. Wikimedia Commons has media related to Platinum. Look up platinum in Wiktionary, the free dictionary. "A balanced historical account of the sequence of discoveries of platinum; illustrated". "Johnson Matthey Technology Review: A free, quarterly journal of research exploring science and technology in industrial applications (formerly published as Platinum Metals Review)". "Platinum-Group Metals Statistics and Information". United States Geological Survey. "International Platinum Group Metals Association".